NOTE: All of these materials must be received by the Nov. 1 deadline for your application to be considered for Early Action, Feb. 1 for Regular Decision. Electronically submitted materials must be received on the application deadline date, and hard copy materials must be postmarked on or before the deadline date. Do not submit additional documents unless specifically requested, as this may delay your decision. If you enrolled in college study after secondary school graduation, you must apply as a transfer student. *You can apply for a fee waiver in the application if you meet certain criteria. We do not send a notification of approval or denial of the fee waiver request. If the waiver is denied, you will receive a $75 bill from us. International students are not eligible for fee waivers. Students who are 1/4 or more Native American blood quantum and are an enrolled citizen of a U.S. Federally Recognized Tribe as certified by their Tribal Enrollment Department will have their application fee waived. **The School Report or Counselor Recommendation must be submitted with an official high school transcript and received in our office by the deadline. For this reason, we strongly encourage counselors to submit the report and transcript electronically. Completing the Common Application or Coalition Application is the first step in your application process. 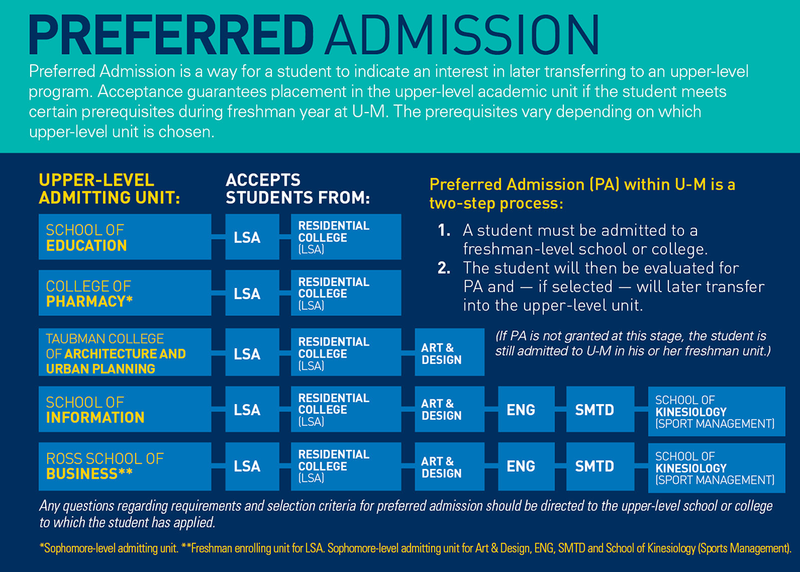 Preferred Admission is a way for a student to indicate an interest in later transferring to an upper-level program. 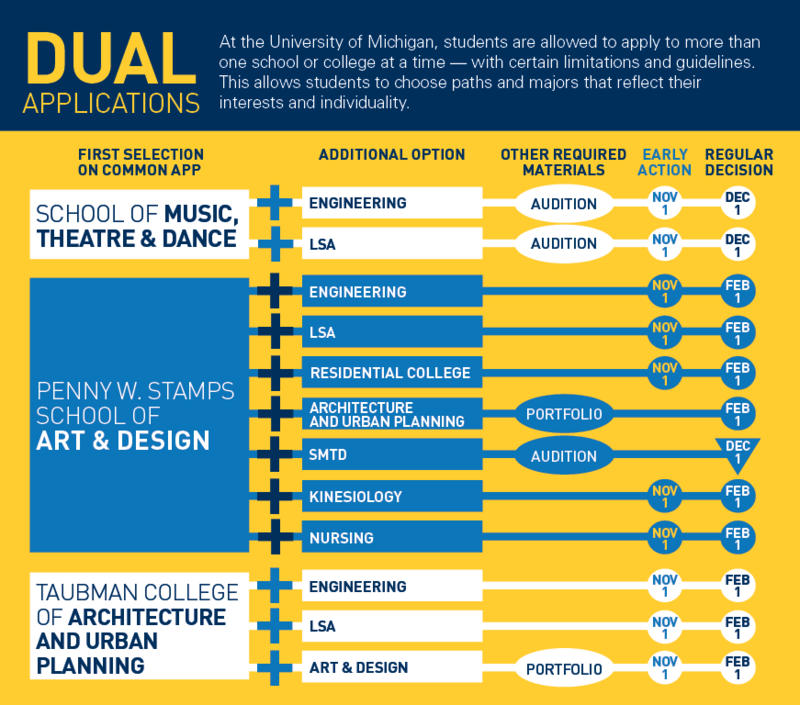 Acceptance guarantees placement in the upper-level academic unit if the student meets certain prerequisites during freshman year at U-M. The prerequisites vary, of course, depending on which upper-level unit is chosen. 1. A student must be admitted to a freshman-level school or college. The Honors Program at U-M attracts students who are driven to go above and beyond an ordinary course of study. This four-year program for academically ambitious students in the College of Literature, Science, and the Arts is the best known of the Michigan Learning Communities for good reason — every aspect of the program is designed to offer a more intense level of intellectual challenge. You’ll study specifically developed Honors courses drawn from nearly every department of LSA, covering topics ranging from human perception to the transatlantic slave trade. Research opportunities start as early as your first two years, and independent projects in collaboration with faculty define your senior year — Honors students have investigated everything from the daily distribution of panic attacks to a new species of stargazer in southern Mexico to why senators vote the way they do on legislation involving climate change. Honors students travel the world for high-profile study and research from Canada to Shanghai — you can track them through Travel Location of U-M Honors Students. The result is a singular program that enables students to soar—Honors students regularly win the most prestigious national scholarships, such as Goldwater and Udall Scholarships and National Science Foundation awards. Once a student has been accepted into the College of Literature, Science, and the Arts, he or she is eligible to apply for the Honors Program. One of the most important sections of the application is the essay — you will be given first consideration when you include one with your application. For essay prompts and more information, visit: http://www.lsa.umich.edu/honors/prospectivestudents. Michigan’s ROTC programs offer you the opportunity to grow into a leader. Each is designed to ground you in the professional background and military skills training needed to pursue a career as an officer in your chosen branch of the service. At the same time, students will be completing bachelor’s degree programs (and, in some cases, graduate degree programs) while defraying the cost of a college education through highly competitive, merit-based scholarships. You’ll have an intensive college life and experience in ROTC through events, opportunities for service with such agencies as the Red Cross, base visits, club and intramural sports, military balls, and much more. You’ll belong to a tight-knit group, forge lifelong friendships, and gain the kind of discipline that will apply to a wide range of careers and professions. Above all, you’ll live the country’s highest values of honor, loyalty, and integrity. From its central location on the North Campus, the Michigan Naval ROTC will train and educate you as an officer in either the U.S. Navy or U.S. Marine Corps. Army ROTC will prepare you to be an officer in the Army, Army Reserve, or Army National Guard upon graduation. The Air Force Reserve Officer Training Corps (ROTC) will prepare you to become an Air Force officer commissioned as a second lieutenant. All programs offer deferment to attend advanced civilian graduate and professional schools. In addition to your home schooled transcript and your ACT or SAT score, we strongly encourage home-schooled and online students to submit subject tests, AP exam scores, or grades from an accredited secondary or post-secondary institution in the academic subjects required for admission. For admission into the College of Literature, Science, and the Arts we encourage submission of test scores or graded work in a natural science, social studies, and foreign language subject. The College of Engineering encourages test scores or graded work in calculus, chemistry, and physics. The School of Music, Theatre & Dance requires home-schooled students (including online high school students) to submit records of school progress and results from at least two SAT subject exams; AP exam results or official transcripts for dual enrollment work completed in an accredited college or university can be substituted for the SAT subject test.